Dimensions 0.50 by 5.50 by 8 in. Amazon.com description: Product Description: After a ten-year silence, Christopher Alexander and his colleagues at the Center for Environmental Structure are not publishing a major statement in the form of three works which will, in their words, "lay the basis for an entirely new approach to architecture, building, and planning, which will, we hope, replace existing ideas and practices entirely." The three books are The Timeless Way of Building, A Pattern Language, and The Oregon Experiment. At the core of these books is the idea that people should design for themselves their own houses, streets, and communities. This idea may be radical (it implies a radical transformation fo the architectural profession) but it comes simply from the observation that most of the wonderful places of the world were not made by architects but by the people. 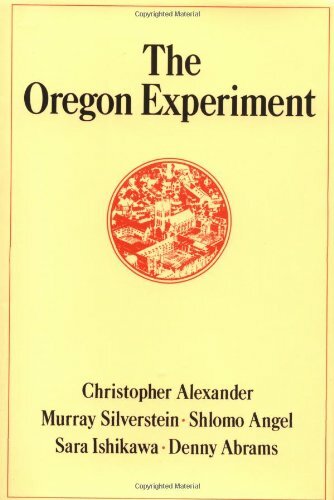 This book is the master plan for the University of Oregon, and is now being implemented at that university; but it shows at the same time how any community the size of a university or small town might go about designing its own future environment-with all members of the community participating personally. It is a concrete example at the Center's theories in practice, showing in simple detail, with numerous illustrations, how to implement six guiding principles: organic order, participation, piecemeal growth, patterns, diagnosis, and coordination.